NASA Spacecraft To Skim Past Saturn's Icy Moon : The Two-Way The Cassini probe will pass within just 30 miles of Saturn's moon Enceladus. The goal is to search for signs of habitability. This false-color image of Enceladus shows so-called "tiger stripes" across the moon's icy surface. Researchers believe the stripes are caused by an ocean beneath the ice. A NASA probe will hurtle past Saturn's moon Enceladus on Wednesday, coming to within just 30 miles of the surface. In the process, it will sample mist from a liquid ocean beneath the frozen surface. Doing so may provide clues about whether the ocean can support life. At just 314 miles across, researchers originally expected Enceladus to be a tiny ball of solid ice. But thanks to NASA's Cassini probe, they now know it's somewhere really special. "We're very confident there's a liquid ocean underneath Enceladus' crust," says Linda Spilker, a project scientist for Cassini, which has spent the past 11 years orbiting Saturn. 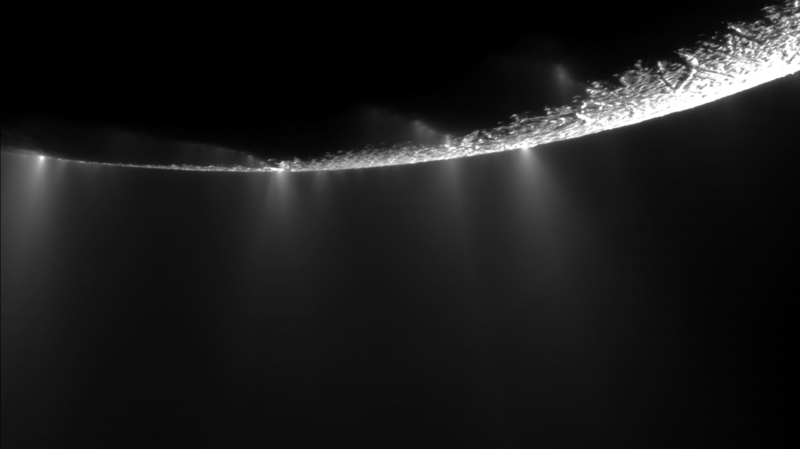 The icy plumes streaming from Enceladus' south pole are mostly made of water, but salts and even some organic compounds have been detected. Cassini has previously sent back images of water literally spewing out of the moon's south pole. Now on its 21st visit to Enceladus, the spacecraft will get closer to the geysers than it ever has before. The spacecraft will streak through the icy mist at 19,000 miles per hour. The entire encounter will last under a minute. The real goal here is to figure out whether the hidden ocean that feeds those geysers could support life. Cassini will look for hydrogen gas burbling out of hot vents on the ocean floor. "By measuring the amount of hydrogen coming out, we think we can better understand the amount of energy available in this ocean, this potential habitat for life," Spilker says. 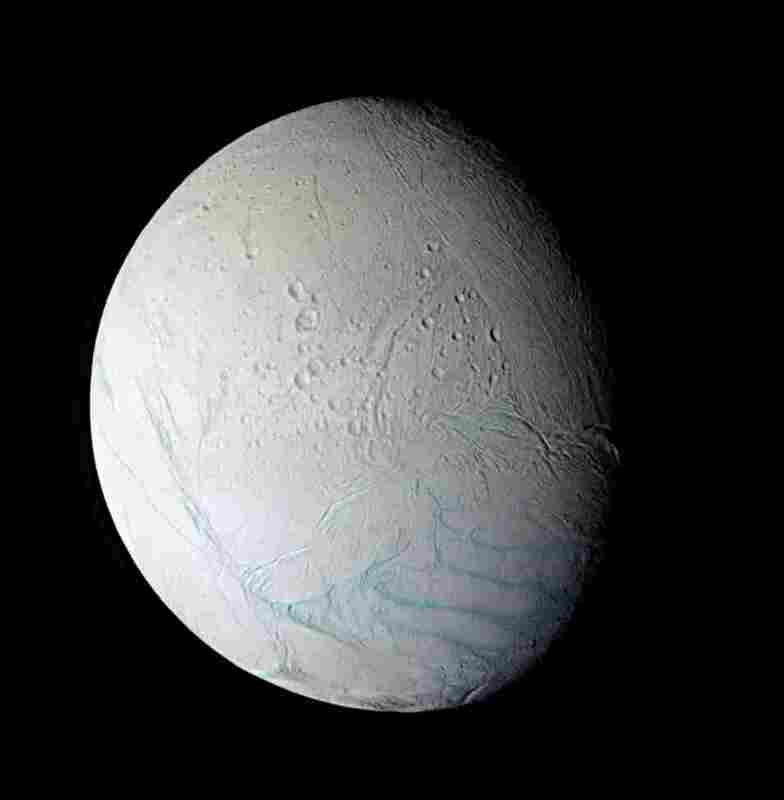 Enceladus is just 314 miles across, but it has a liquid ocean. Researchers think tidal gravity from Saturn and other moons keeps it from freezing solid. On Earth, there's definitely life in hydrothermal vents. Cassini won't be able to tell whether the same is true on Enceledus, but if there is, Spilker says, it's not much of a life. The alien beings would cling to their vents, in darkness, far beneath the icy surface. "[They] wouldn't know about the sun that was up there," Spilker says. "Or anything else that's going on."